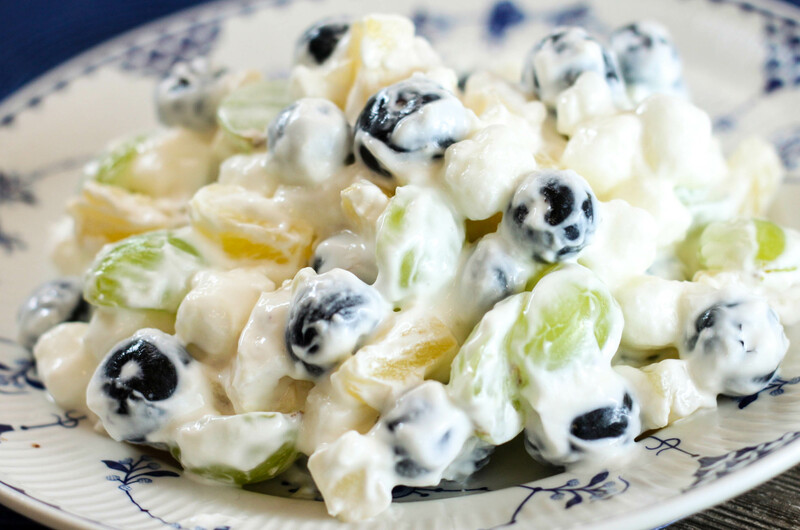 Blueberry Ambrosia Fruit Salad is a twist on the classic delicious Southern dessert recipe, filled with blueberries, marshmallows and a creamy dressing. 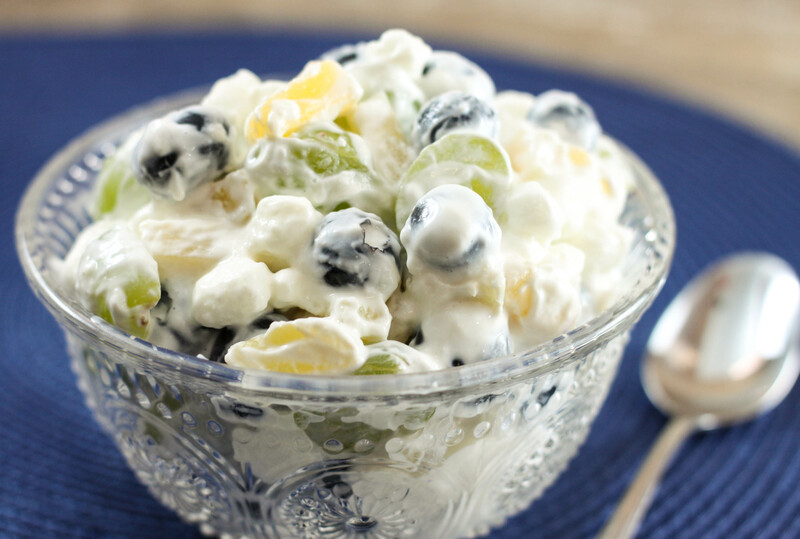 The classic Ambrosia Fruit Salad recipe has mandarin oranges and maraschino cherries. My friend Brandie at The Country Cook has a great recipe you can try if you are looking for the original recipe. It also looks like it has cool whip mixed with the sour cream. You could very easily modify this Blueberry Ambrosia by adding half sour cream and half cool whip if you would want to try that flavor combination. This recipe is super easy to make, my favorite kind! Start by halving your grapes. Mix together the sour cream and sugar. Add remaining ingredients and refrigerate at least an hour prior to serving, stirring multiple times. 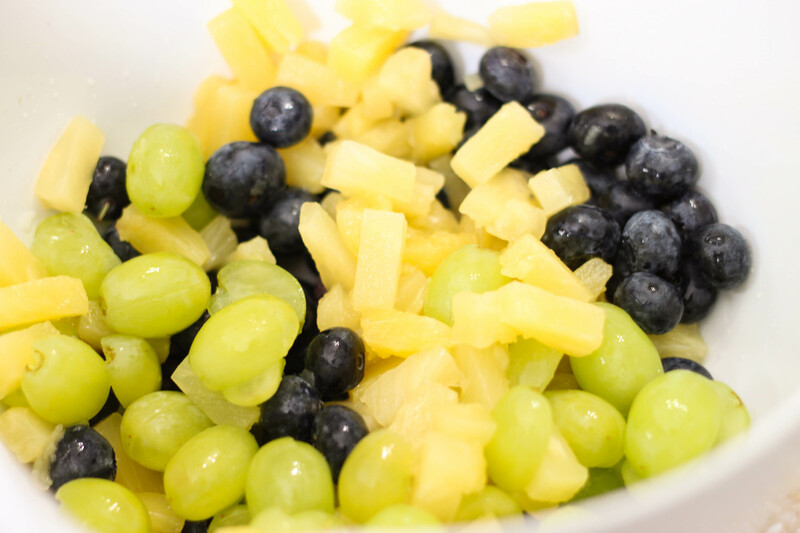 This recipe is the perfect fruit salad for a bridal or baby shower – you could even add more blueberries if you were looking for something light and blue to serve at a baby boy shower. It would be great to service at a tea or women’s lunch. If you plan to take it to a potluck or picnic this summer just be sure to remember a larger bowl and ice so you can put your serving bowl on ice for food safety reasons. Refrigerate for at least 1 hour before serving stirring occasionally. 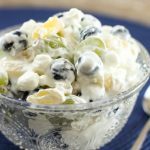 I wanted to stop by and let you know your awesome Blueberry Ambrosia Fruit Salad (love the bowl too- sooo pretty) is featured today at Weekend Potluck. Thanks so much for sharing your wonderful recipe with all of us at Weekend Potluck! We hope to see you again at this weekend’s party! Thanks Mary! I hope you have a wonderful Memorial Day weekend! Thanks Marsha! Hope you have a great weekend!